We just ordered a colleague a Star Trek commander baby-gro (for his newborn not him). They are so cute! I love your iPad cover too. My friend and daughter both read it and LOVED IT. I'm loving your haul this week. the GAme of Thrones graphic novel looks great and I hope you love The Scorpio Races. I am STOKED about that GoT graphic novel situation. And I just finished TSR and I did love it! Can't wait to hear what you think of Rebel Heart! Ohmygosh! The little Zelda onesie might be the cutest thing I've seen in my life! That Zelda onesie is EPIC! I really liked the Scorpio Races! Rebel Heart on the other hand was a little disappointing compared to Blood Red Road but still a good read! I haven't read the others so I will wait to hear what you think of them! Percy Jackson FOREVER. Honestly It's the best. That would be an understatement to the gloriousness that is Percy Jackson. I try so hard to get people invested in this series, but when I tell them it's mg fiction they lose interest, which is really sad because this series is phenomenal. I've heard amazing things about The Scorpio Races! The iPad cover is so pretty too! Lovely haul this week, happy reading! Oh, I really liked Skinny! ALSO OMG THAT ONESIE. WINNING. The Scorpio Races was my last book of 2012, I loved it something fierce. TAMORA PIERCE. Oh man. Tamora Pierce. I love her. I love Alanna and Daine and Kel. I love Tortall. And I love Percy Jackson. And baby clothing. Ugh your haul is amazing. ENJOY! I've fallen head over for Tamora as well! Hehe Zelda Onesie :P The Scorpio Races is SUCH a good book. It's just *sigh* fantastic. Read it soon! Hopefully you like it. Also, the Song of the Lioess series is something I've reread multiple times. I cannot express how much I love that series. I loved Rebel Heart. But then again, that's one of my favorite series. The Zelda onesie is to die for. Great haul! I'm going to start Rebel Heart tonight! WEE! I love the Link onesie! It really makes me want a baby. 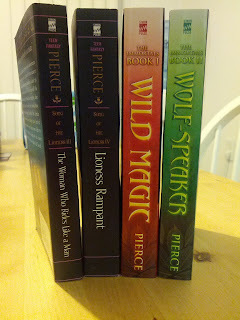 As for the books I read Tamora Pierce's Alanna books over and over in middle school. It's been a while since I've read them, but would love to go back and reread them. Just so you know, your new child is going to be the flyest Ganondorf-slayer to ever walk into the realm of reality. He/she will be walking around with Triforces on his/her toes for crying out loud. I LOVE THE ONESIE. Is there a larger size, do you think? And that iPad cover is PERFECTION. looks like you have some important fantasy reading to do, my friend! 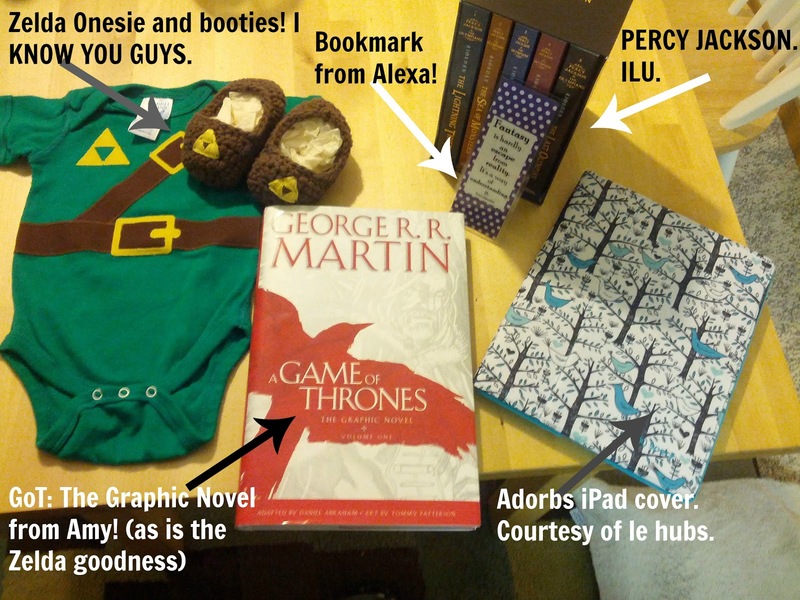 OMG -- the Zelda onesie! My hubby's jaw hit the floor when he saw that one. Where did you find it??? Ooooh... thanks! I'm heading over to check this out now -- so freakin' adorable! OMG OMG! *nerd explosion* I love that Link outfit!! 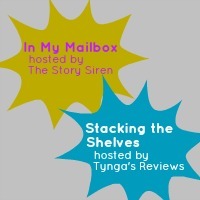 Also, excellent books and I hope you enjoy them! Thanks for stopping by mine! The Zelda onesie is adorable. A page from work dressed as Link from Zelda for Halloween. She looked just like him! I am DYING over that Zelda onesie!!! Can't wait to read Rebel Heart, I've had Scorpio Races for a while and I still haven't read it (I hope to rectify that soon!) Happy reading! That onesie is the cutest thing EVER!! ALSO, despite the fact that the first Percy Jackson movie was a bigger monstrosity than M. Night's Airbender (wasn't), I am still going to see the next one because my favorite browncoat is playing Hermes. Sorry. I digress. OH MY LORD YOU HAVE THE BEGINNING OF THE IMMORTALS SERIES. 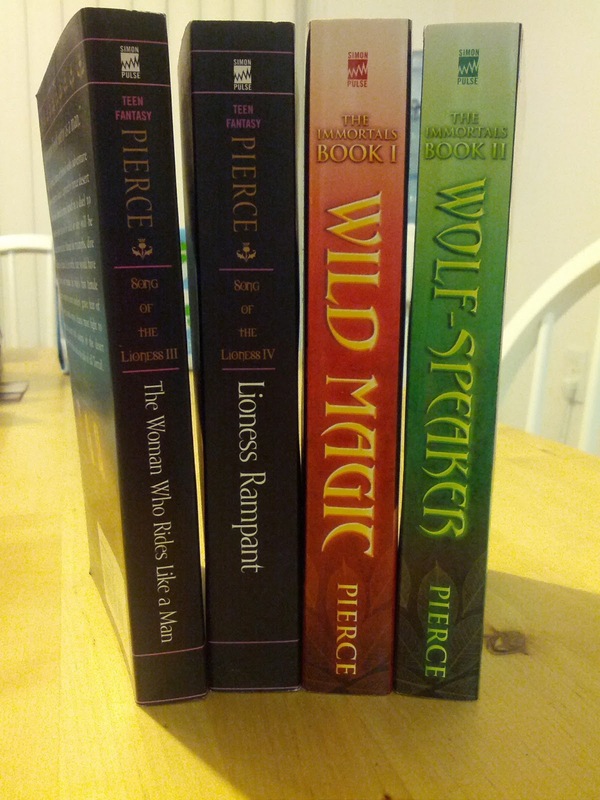 *starts jumping up and down* I LOVE that series from Tamora Pierce. Like, love, love, love it. I can't wait till you get around to reading it! So glad you read it! Yeah, yeah, yeah. Let's not even talk about how behind in my reader I am. But seriously. That onesie? There are basically no words for that one.